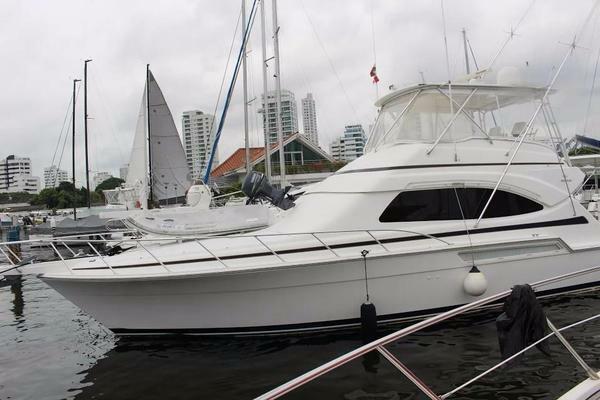 United Yacht Sales New Jersey would love to guide you through a personal showing of this 48' Silverton 48 Convertible 2004. This yacht for sale is located in Greenport, New York and priced at $420,000. For a showing please contact us by filling out the form on this page and we will get back to you shortly! Emily Grace is a good-looking flybridge yacht with a versatile layout and a spacious interior. No wonder she is one of the best selling boats in her class. She has a solid fiberglass hull with a wide 16'4" beam and prop pockets. Her three-stateroom interior includes two double staterooms including a large amidships master with walkaround bed. A comfortable salon features a solid cherry table, Bose stereo system, and an Ultraleather sofa with recliner and concealed rod storage. Her full-service galley is well equipped. Forward windows provide additional natural lighting in the salon. A hatch in the galley sole reveals a huge storage compartment. A livewell, raw water washdown, freezer, transom door, and engineroom access door are found in the cockpit along with molded steps for easy access to the flybridge. She is powered by T-715 HP Volvo D12 diesels with 570 hours. Check out the Full Specs and call for an appointment to see Emily Grace.